A grey, rainy Saturday in Minneapolis was the setting for day three of the 2014 Lincoln Stars tryout camp at Ridder Arena. As was the case on Friday, the afternoon session on Saturday began promptly at 2:00pm. Not surprisingly, I thought the overall play on Saturday improved compared to what I saw on Friday. I think the players are getting better accustomed to the pace of play along with feeling more comfortable with their teammates. Team Boll rebounded from a 0-2 hole in this game to score three unanswered goals to beat Team Bartkowski by a score of 3-2. Team Boll finished the camp with a 3-1 record, while Team Bartkowski finished with a 0-4 record. Scoring goals for Team Boll was Miguel Fidler (2), and Michael Gillespie.. Scoring goals for Team Bartkowski was Wes Baker and Luke Jaycox. The Team Boll trio of goaltenders played extremely well in this game. Both Tommy Nappier and Brady Boudreau pitched a shutout, while Tanner Holmes gave up two goals. Team Bartkowski goaltender Parker Butler started the first half of this game and gave up one goal. Team Bartkowski goaltender Hunter Shepard started the second half of the game and gave up two goals. Players from Team Boll who stood out to me were Miguel Fidler, Dylan Malmquist, Michael Gillespie, Dominick Mersch, Lubos Vacek, and Tony DeVito. My MVP of Team Boll goes to forward Miguel Fidler who had two goals. Fidler is a prototype power forward who has a great combination of size and speed. He's definitely a kid who is not afraid to go to those dangerous areas of the ice to score dirty goals. Players from Team Bartkowski who stood out to me were Wyatt Kalynuk, Luke Jaycox, Jared Bethune, and Conner Blanck. My MVP of Team Bartkowski goes to defenseman Wyatt Kalynuk, who is another kid I hope the Stars can find a spot on their roster for. Wyatt is solid in all aspects of the game, and is one of the better skating defensemen in this camp. Team Backes exploded for 6 goals in the second half of this game to propel themselves to a 8-3 victory over Team Johnson. Team Backes finished the tryout camp with a 3-1 record, while Team Johnson finished with a 1-3 record. Scoring goals for Team Backes was Jonathan Desbiens (2), Nathan Dingmann, Zach Paxman, Angus Scott, Wes Michaud, Troy Terry, and Luke Shiplo. Scoring goals for Team Johnson was Michael Rosholt, Cameron Lee, and Sander Boroczky. Team Backes goaltender Jacob Nehama played the first half of this game and did not give up any goals. 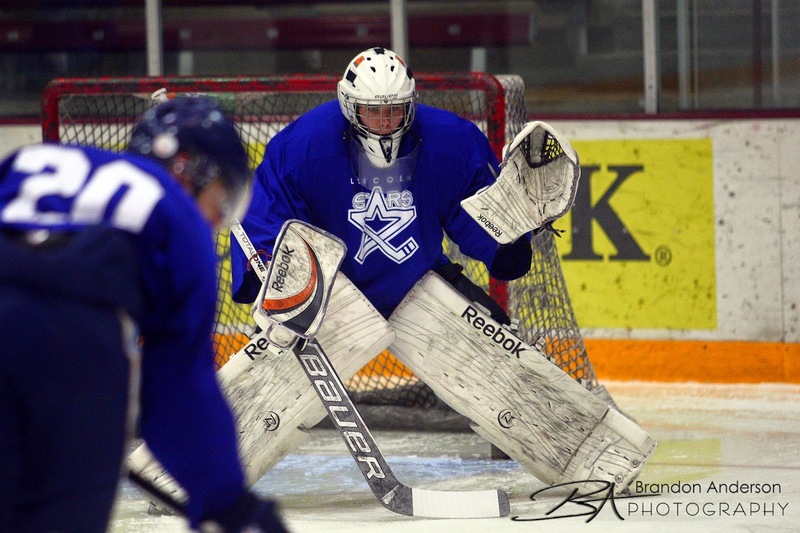 Team Backes netminder Holden Kurtz played the second half of the game and surrendered three goals. Team Johnson goaltender Quentin Prokopetz started the first half of this game and gave up two goals. Team Johnson goaltender Cody Gibson started the second half and surrendered six goals. Players from Team Backes who stood out to me were Jonathan Desbiens, Wes Michaud, Blake Christensen, Tyler Jutting, Ryan Jones, Jacob Nehama, and Troy Terry. My MVP of Team Backes goes to forward Jonathan Desbiens who had two goals and could have easily had two more. "Frenchy" was easily the best forward on the ice in this game. Nice to see the Stars veteran playing so well. Players from Team Johnson who stood out to me were Cameron Lee, Aaron Lara, Sander Boroczky, Ethan Jack Badini, and Ethan Frank. My MVP of Team Johnson goes to defenseman Cameron Lee. Like other defensemen (Vacek, Kalynuk) I've gushed about, Cameron is the real deal. He has to be one of the better skating defenseman I've seen in a long, long time. He has incredible wheels, and just plays a very poised, controlled game. He's another player I hope to see on the Stars' roster next season. The last game of day three of tryout camp saw Team Bollig get a 5-1 victory over Team Dzingel. Team Bollig finished the tryout camp with a 3-1 record, while Team Dzingel finished with a 2-2 record. Scoring goals for Team Bollig was Endre Medby, Colton Fletcher, Dominick Sacco, Chris Klack, and Blake Brazil. The lone goal scorer for Team Dzingel was Matt Rudin. Team Bollig goaltender Jake Berger played the first half of this game and surrendered only one goal. Team Bollig netminder Peyton Jones played the second half of the game and pitched a shutout. Team Dzingel goaltender Josh Creelman played the first half and gave up one goal. Team Dzingel netminder Tanner Creel started the second half and surrendered four goals. Players from Team Bollig who stood out to me were the goaltending duo of Jake Berger-Peyton Jones, Dominick Sacco, Colton Fletcher, Will Scherer, Chris Klack, and Endre Medby. My MVP of Team Bollig goes to forward Colton Fletcher who has taken full advantage of playing alongside Stars veteran Dominick Sacco. Colton is another kid who has a good combination of size and skill. He's also a player who is not afraid to crash the net in order to initiate a scoring opportunity. Players from Team Dzingel who stood out to me were Quin Foreman, Anthony Wyse, Tyse Ausmus, Josh Creelman, and Harrison Aide. My MVP of Team Dzingel goes to defenseman Tye Ausmus who is another talented defenseman that I hope we see in Lincoln this next season. Ausmus is one of those kids who definitely plays bigger than his size.